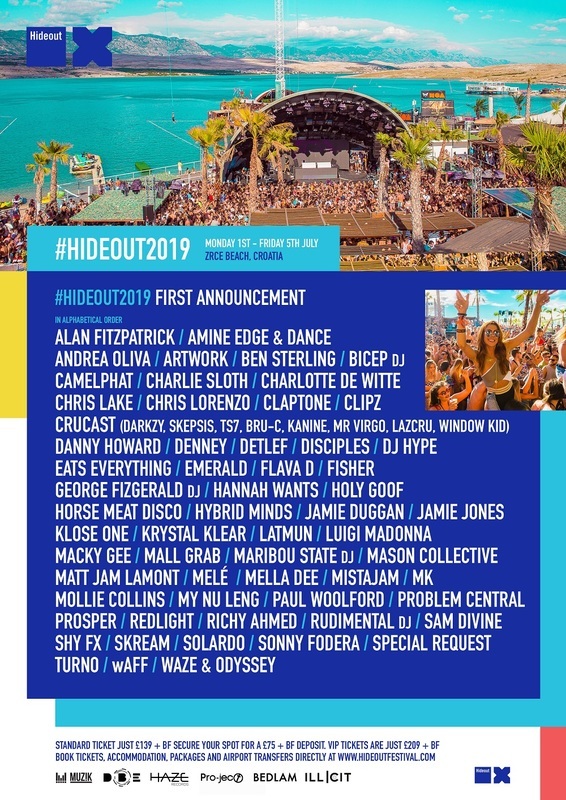 Rudimental, Bicep, Mall Grab, Fisher, Shy FX, Charlotte De Witte, Mella Dee and Monki are among the first acts confirmed for Hideout 2019. The festival returns to Zrce Beach on Pag Island in Croatia from Monday, July 1st to Friday, July 5th featuring five venues plus pool, boat and beach parties. Also among the first acts confirmed are Maribou State, George Fitzgerald, Horsemeat Disco, Skream, Denney, Krystal Klear, Camelphat, Solardo, My Nu Leng, Flava D, Holy Goof, Klose One, Redlight, DJ Hype and Clipz. Limited tickets are available to registered fans from today (November 6th). General tickets will be available from Thursday, November 8th. For details go to hideoutfestival.com.